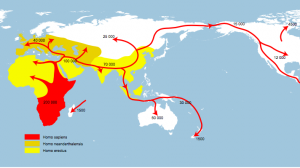 A map of early human migration patterns. The story of migration is the story of humankind. The genetic and paleontological record of human migration is at least 60,000 years old. Researchers know that all humans can trace their origins to Southern Africa, while some homo sapiens migrated across Africa and stayed, others ventured out to the Asia, Australia, Europe, and eventually to the Americas. This is our shared experience. Students who have to knowledge, skills, and dispositions to work to build bridges between newcomers and receiving communities.